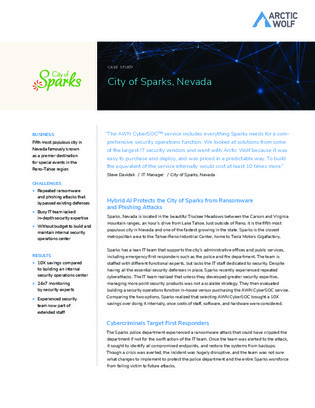 Sparks, Nevada has a lean IT team that supports the city’s administrative offices and public services. But ultimately the city was seeking the IT staff dedicated to network security. This case study explores how the Sparks IT team compared the option of building their own security operations center to purchasing a comprehensive managed service. Discover how a hybrid AI architecture provided the best combination of human intelligence and machine scale to deliver 10x better threat detection and 5x fewer false positives.